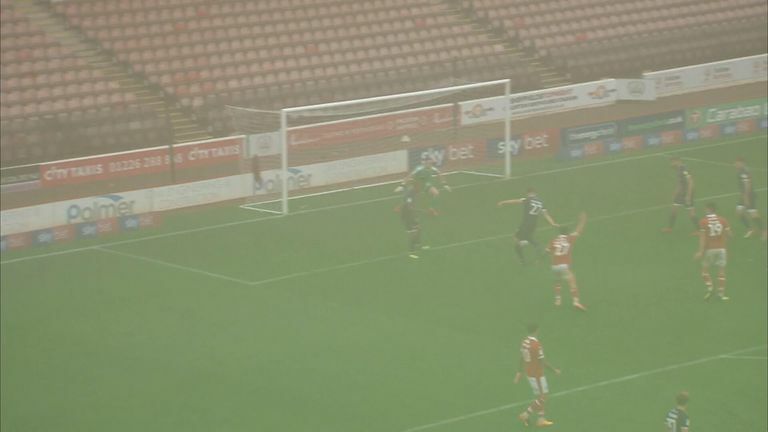 Moments before Walsall scored a stoppage-time equaliser against Barnsley, Jack Fitzwater missed a golden chance from just eight yards out. The high-flying Tykes had taken the lead through Victor Adeboyejo, the substitute bundling home Alex Mowatt's cross from four yards out, but Walsall continued to pressure in search of an equaliser to prolong their unbeaten start to the season. It almost came with 88 minutes on the clock. Kieron Morris picked out Fitzwater in the centre of the Barnsley area, but the 20-year-old, who is on loan from West Brom, somehow placed his shot the wrong side of the post with the goal at his mercy. His blushes were spared just seconds later, however, when Andy Cook picked up George Dobson's pass, turned his man and fired the ball under Jack Walton to earn a share of the spoils. Click on the video above to see Jack Fitzwater's glaring miss in all its glory.